Polarity Therapy is an energy-based system of bodywork that also incorporates the components of diet, exercise and self-awareness processing. Drawing from a wide range of resources, Dr. Randolph Stone, DO, DC, ND (1891-1981) acknowledged that the human energy field is affected by touch, diet, movement, sounds, attitudes, relationships, life experiences, trauma and environmental elements. Life-giving energy permeates every aspect of the human body. In Polarity Therapy, health is embraced when the body’s energy gently and easily flows without significant stress or compensation. We each hold the impact of trauma in our body as cellular memory. The result is that the body, as a whole system, has to compensate to incorporate the trauma. Over time and without intervention, the body becomes more “attached” to the dynamics which are holding the original trauma. Using polarity therapy may assist in the realignment of the body’s natural energy patterns, re-establishing health and balance. Many clients coping with trauma have found this approach to be especially helpful. In a Polarity session, the practitioner interacts with the client system and areas of compensation using skilled contact, observation and dialogue, shifting the energy to balanced flow patterns and a more open, available and flexible energy field. In a session, the client is supported in increasing self-awareness of the subtle yet profound energetic sensations. Naturally, the results vary a great deal, from a sense of relaxation and well being to a new insight into an energetic pattern or relief from a difficult situation. 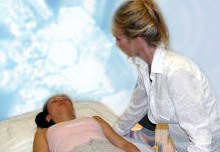 Polarity therapy is a comprehensive treatment approach. Because stress in the energy flow can be a precursor to actual medical conditions many clients report using this approach as a preventive strategy.